[CONT]:Sentinel. 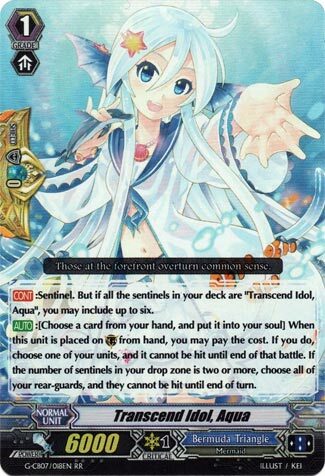 But if all the sentinels in your deck are “Transcend Idol, Aqua”, you may include up to six. What’s up, Rogue Squad?! For today’s card, it’s about time we talked about the elephant in the room that is the potential sextuple Sentinel unit that is the new Aqua. This makes all other sentinels seen recently look like crap, and yes, that includes anything non-Bermuda. Personally, this is the best PG people will see for a long while (at least until the V Era begins). This card synergizes with almost every Bermuda build, especially with one of the best builds out now: Coral. Combine this with the potential to Dizmel all of your rear-guards to immortality in battle makes this a must have in your mermaids. Next Time: Another cart on the Chouchou train. Oh wow, I just love it when something shits on established mechanics (yes, sarcasm is unbecoming of me, I know). Anyway, putting the 6 copy thing aside, a Perfect Guard that can also recharge soul for costs is automatically a good reason to run it. So really, the fact that this can also protect all your rear-guards from stuff like Vanquisher VMAX and similar is just overkill, in my book. Would I actually run 6? Not really, Bermudas need to have quite a lot of combo pieces, which you can’t waste on cards you’ll never call or use for bouncing, but it’s still a snazzy card.